24 p. : ; 25 cm. Speech of Hon. 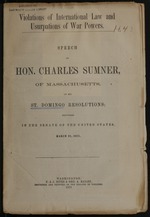 Charles Sumner, of Massachusetts, on his St. Domingo resolutions; delivered in the Senate of the United States, March 27, 1871.